Expect the days to be HOT and humid at each port you visit. If you can stand the heat and like to sweat, then you&apos;ll have a great time. I enjoyed the food offered on the ship, the chefs had nightly special, that gave you a chance to try foods that you wouldn&apos;t have a chance to enjoy otherwise. The crew couldn&apos;t have been more helpful, from keeping the room clean, deck dry, and even cleaning your shoes after coming back from shore excursions. The entertainment on board the ship was limited, except they showed several movies about the area, which help you gained a better understand of their culture and customs. Enjoyed visiting villages, palaces, temples, and homes while on the cruse. Took the pre-excursion to Bangkok, Thailand and was glade that I did. Bangkok is truly a colorful city to visit and their temples have the WOW factor that you just can&apos;t miss if you want an enjoyable vacation in Asia. 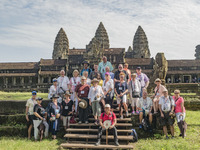 Tour group enjoying the ruins in Cambodia. The cabin was small and bare bones, no TV, radio, or phone. For a small ship that is what I expected. The walk-in shower, however was larger than expected.